By a strange quirk of fate I have started to enjoy my fishing again, OK the results have not gone to plan and I have struggled with my mince pies for a while, but I am feeling as if results are only a little bit away. First match of the year saw me arrive with no vision( wrong glasses) and a blur on the water. Second match I had correct glasses but the fish did a disappearing act and this was backed up in the Alders Spring League. Today would be my first attempt on Ash Lake, Mick was in attendance so the MK Nugget was primed and polished. I even had 5x20p pieces in case he battered me. at the draw I was asked to hold the tin whilst Mick pulled out peg 2, how does he do it. It is his favourite peg and I have not known him to not catch from it. Colin had drawn peg 1, whilst on the opposite bank Matt was on 30, with Roy Makins on 29, Madd on 27. As is the norm, Trevor had the last peg in the tin Peg 10, leaving me with 21. I was happy with that, the wind may cause an issue but nevertheless it was a good draw. For company I had Pete Goode on 17, 6m Dave Adams on 20 with Sean Wain on 23. I plumbed up and found around 4ft at 11m, this was fairly flat throughout the number 8 section, so opted to fish front of the section before going further out as bites tailed off. A topkit plus 2 sections in front of me and at 6 sections to the tree. My last rig was a margin rig for maggot late on.Bait was 6mm fishery hard pellets with 4mm fishery feed pellets. 3 pints of maggot would do for the last couple of hours down the edge. Well, that was the plan. I started off feeding a small pot of 4mm sinkers and followed this up with a baited 6mm hard pellet. The wind was alright and pushing the rig from right to left but after 10 minutes I had my first carp around the pound mark, A slightly larger one followed before the line went quiet. I started feeding via a tosspot every put in, lifting and dropping the rig regularly, nothing. I had a brief spell at top 4 but nothing so went out again this time fishing the whole of the number 8 section. After a couple of minutes, another small carp. 10 minutes passed and a few indications but it was getting hard to see in the ripple and I was striking at nearly every movement of the float. I then switched rigs to a heavier .5g float which gave me more stability and positive bites. Roy Makins was catching well, I could see Mick and he was putting two fish in the net to my one, so I knew early on where the nugget was destined. Dave had started well but was now struggling and the pegs on the cafe bank were all netting a few fish. It seemed the only place I could get a bite was at a full 11m and it was a case of lifting and dropping to induce a bite. I tried a shallow rig over this line in case the fish were higher in the water column but no joy. I was now fishing in any areas of shade or dark water I could find, The ripple was constantly changing direction and with the wind speed increasing in strength at times it was difficult to hold the pole, even at 11m. A few more fish succumbed to the 6mm hard pellet but nothing from the top four line or surprisingly the margin line. Two pints of maggot went into the tree and not a single bite from them. At the all out, I was happy with my day, I knew Mick had beaten me, but I felt I had done the best I could from the peg on the day. Dave threw back around 25lb, Sean had 51lb, Madd weighing in a late caught 45lb. My fish went 53lb 13oz for the best weight on the dam wall and only beaten by Roy Makin's from peg 29. The cafe bank was different gravy though, 94lb a couple of 80s and 70s. Well done to all the winners, framers, section winners and for Trevor claiming the Silvers King title with 21-06.Nice to hear Richard cheering you on today. So Mick has taken another MK Nugget for a 2-0 lead, seems to have a familiar ring to this. My next match is Monks Lake 3 on Saturday. After feeling as if I had done as well as I could on the previous match, I was looking forward to fishing at Monks Lakes again. This time on Lake 3, a pool I had not fished before but I had the others over the years and felt if I attacked the peg then the fish will come. I had been in touch with a good friend, Mark Hathway and he pointed me in the right direction, I suspect it was for the open water pegs because my silver fishing resulted in a solitary skimmer, but more of that later. Mick was driving and with a good 90 minute drive ahead we arranged for 0545 pickup.This should get us to the venue in plenty of time to sample the delights of the new on site cafe. However, like all best laid plans, as soon as we hit the M25 we came across messages stating delays on the QE2 bridge. Still we had no choice but to persevere on and hope it would clear by the time we got there. When we did, it held us up for around 35/40 minutes. Interestingly the signs stated "Salt Spreading". Lost on me, why would they be spreading salt on the motorway during the busy driving hours when the ground was laden with frost all around. My theory was we were being invaded by continental slugs and snails and it was a control measure. When we did arrive it was rammed in the cafe, another match was going on, so a rather long queue formed in front of us. A bacon baguette for me and a sausage/bacon baguette for Mick followed by tea and coffee all on the hoof as the draw was already taking place. At least I had a good draw, according to the locals 112. Now I have not seen the lake before but I do know that the pegs on the end of the spit's are normally good draws.Mine though was 15m to the far bank and a proper struggle to reach with a pole. The cold north easterly breeze was whipping up the waves, but was lovely when the wind dropped. Looks closer but 15m to the protruding reeds. I set up a couple of rigs to fish the peg, one a .5 MW Hi Viz margin, another at .3 if the wind died back a lot. A heavier diamond in .75g if the wind got up more. Bait would be pellet on this line. I also set up another line at 11m straight out in front at 10 and 2 o'clock, one would be fed with groundbait, maggot and chopped worm for skimmers and ide. The other would be a pellet line. Along my bank and my section, were Clive, Kyle John and Mark Fox. Behind me I had Chris Thomas, who had won the last round at Arrans. Chris Thomas Peg 113, a lot closer than mine. Tony W and Gino who were busy setting up tip rods to launch across to the empty pegs on the far bank. Josh and Terry completing their section. At the all in I cupped in some pellet across to the far bank and 2 o'clock line. A couple of lightly packed balls of GB with a few dead reds and some chopped worm. I started off on the 10 o'clock silver line, but nothing after 15 minutes. A switch to the pellet line and again nothing. Adding a few coloured sections I managed to push the rig out to 15m, fed and after a few minutes, a dip and my first fish was on, feeling it was foul hooked it soon tore off and broke the hooklength. A new hooklength and out again, 10 minutes gone and another fish on and off. Chris was catching well across in the little bay in front of him. Not a ripple there but I was struggling to hold the float still even overdepth. Still I felt the only way I was going to compete was to catch carp and to do that I needed to fish this long 15m line. I cupped in a bit more pellet and even tried a big bunch of maggots and a whole dendrobena on the hook to see if this would improve matters, on another day it may have worked but not today. Chopping and changing pellets saw a few bites finally connecting with my first fish around the 90 minute mark, a cracking mirror around 9lb. 10 minutes later, a 6lb common and I was thinking perhaps they had turned up and the rest of the match would see a procession of big carp come to the waiting net.How wrong I was. No more bites on any of the lines, set up a margin rig which doubled as a shallow rig. Tried that, nothing. After 2 hours I had a couple of small indications on the float and another 5 carp came to the net along with a solitary skimmer. Chris had blitzed the match, a good peg and a good angler on it. Plus it was fishable, which helped him I am sure. Before the match had started I had gone along to Gino and informed him to cast tight to the far bank, Tony had also been listening as he quickly set one up as well. Both ended up fishing the tip nearly all day and ended up second and third overall. Gino with part of his tip caught haul. 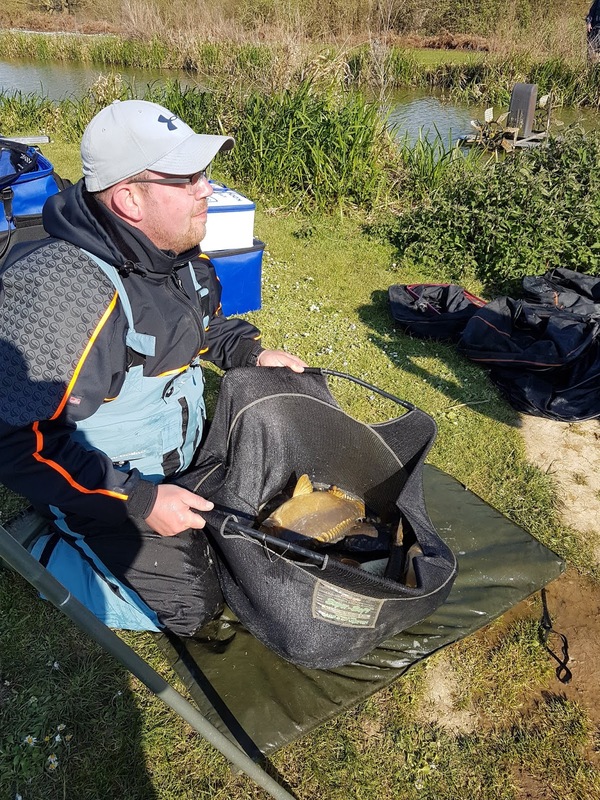 Josh had also caught a few further along that bank so it seemed the fish wanted to be out of the wind as much as possible.Tony Roberts managed a creditable 30lb of silvers to show that in the hands of an expert, maggots can catch fish. So I have started to show some respectability in the league, a long way off the lead but I will keep striving towards the top. I have taken back a MK Nugget from Mick, so it is now 2-1 in his favour. My next match is Tuesday at Alders on my own and on Wednesday at Oakfield with Mick. The last time I was on Pines, I felt that I did the best I could from a peg that did not contain many fish, but we as anglers have to endure those days and pegs. Mick always says to me that no peg is a bad peg, we just do not know how to fish it, and I suppose he is right. So armed with a good couple of results behind me, I was looking forward to fishing one of my favourite lakes. As per usual I arrived nice and early at the fishery, thus avoiding the migration of traffic in and out of Milton Keynes. Replacing my old chopped worm scissors with one of the new Garbolino Bait Choppers I was determined to set up a line for silvers. A chat with a few of the lads revealed it was a bit patchy at the weekend and with a good turnout expected today, my main aim was to not throw it away at the all in, by cupping in lots of bait. With pools and peg fees paid I dipped my hand into the tin of dreams and out comes peg 4, happy with that. Mick had fished it a couple of weeks back and caught plenty of skimmers at 7m, so this would be my silvers line. I set up a corn line at 2 plus 2 and also plumbed up a line at 12m for fishing pellet. I also had a bomb rod with me, more for tomorrow at Oakfield but it was there so I got it out. For company I had Pete Archer on 3 and Sean Wain on 5, Trevor and Madd were directly opposite, along with Mick Kelly, slowly getting back into his fishing. At the all in I fed three balls of GB to 7m mixed with chopped worm, dead reds and a few micros. A pot of 4mm fishery pellets to 12m and a sprinkling of corn to top four. Working my way out of the peg, I started off on corn, feeding three or four grains every 30 seconds, one quick bite kept me interested before the float buried after 10 minutes and a good sized common around 5lb was in the net.I persevered for another 20 minutes but this line was not working as bites were at a premium. A move to the 7m line with a lighter rig and fishing a couple of dead reds over depth again saw no bites. Pete was also struggling and took him 40 minutes for his first bite, a small perch and a couple of rudd. Sean on the other hand was fishing the waggler towards the island and pinging maggot. He was getting bites regularly and made me rue not bringing a waggler rod. Trevor opposite was also getting a few on the waggler, again towards the small island in front of him. 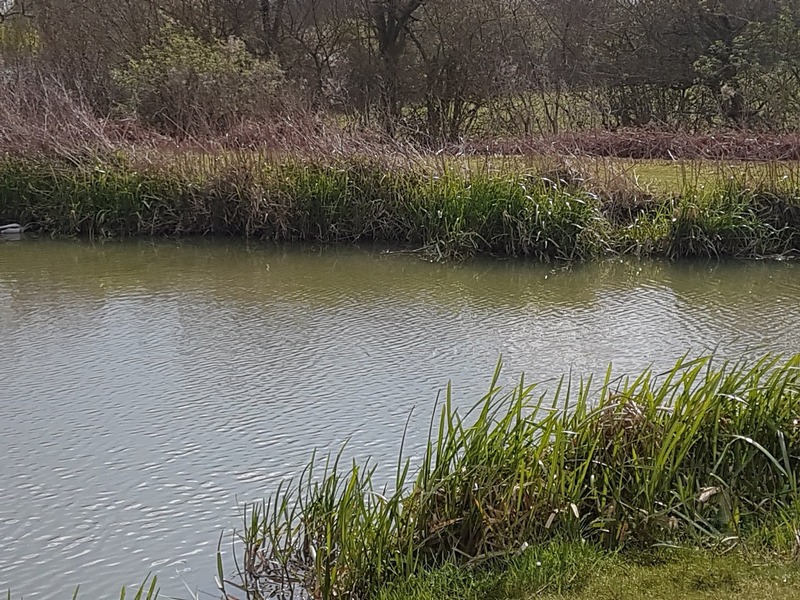 I went out to 12m and despite the increased depth I was getting a few odd dips and missed bites, a foul hooked carp made me make a decision to switch to fishing shallow. Pete was nicking odd silvers and small carp shallow on maggot, admitting his feed pellets were still in his car. Unfortunately, I did not have many myself otherwise I would have shared some with him. Changing rigs around I shortened a margin rig and started pinging 4mm's. After 10 minutes a dip and fish on, followed by fish off. Out again and the same happens. Adjusting the rig slightly saw the third attempt successful and a common carp around 3lb was in the net. A few more came in the third and fourth hours. 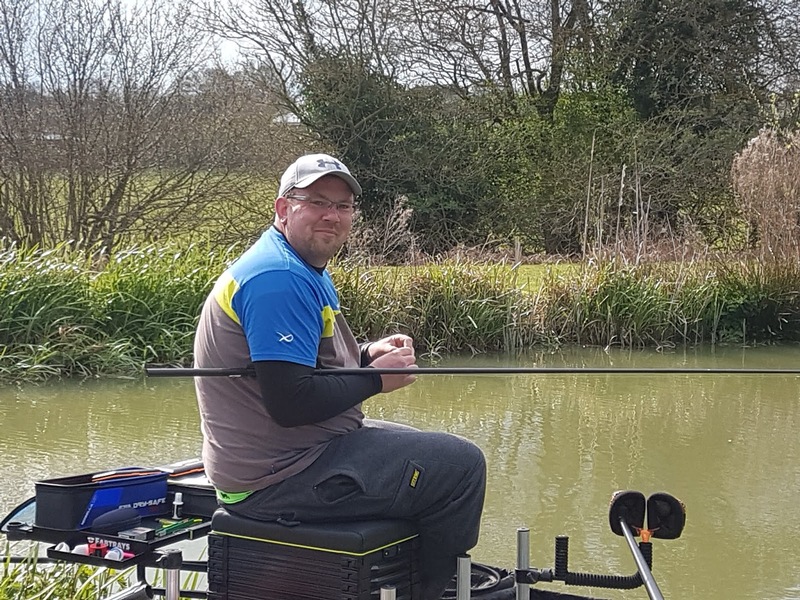 Sean and Trevor were still catching well, Pete had started getting amongst the carp and Gary Page was sneaking a few fish from in front of the next peg and at the end of a reed bed. madd was trying to see how many wagglers he could fish at the same time. Me I was still in touch but needed a good last hour to cement my place. Alas it was not to be, I struggled for the last hour, only putting one fish in the net. Pete's peg had come alive, once his limited supply of 4mms started to work. Sean had switched from the waggler to the pole and was still getting amongst a few fish to edge him in front. Well done to all the winners. New Silver's King in Gary Page. A good close match, a few lost fish here and there have cost us all. My next match is tomorrow at Oakfield, a MK Nugget will be at stake, so something to fish for and a catch up with a different set of fishing buddies. Considering the amount of time I have been writing these blogs, I think I have tried to convey all the joys and some of the moments where you wonder where it all went wrong. I publish both and let others judge the content for themselves, they can either use it to there advantage or if the want to win, do the opposite. After yesterdays match at Alders Farm where I sneaked in the coin with a section win and only 4lb behind second, I was buzzing. I think I am fishing well and getting my decisions right. Today would be a test, a venue I cannot fathom out, Red Kite Lake at Oakfield Fishery near Aylesbury. I have been here at least a dozen times over the years and looking back I think 70lb was the best I could muster from it, more than often I have thrown back in the region of 30lb. Mick was in attendance this week and with a MK Nugget at stake I would have my work cut out. Dave Stratful was still behind the counter and after a couple of Bacon Sarnies and a mug of tea I was happy. Mick was equally content with his Full English. At the draw I let Mick go in first, as seems to be the routine and out comes 33. A peg on the right bank for him. I was next and peg 23, up the other end on the same bank. I had Neil and Paddy for company on 21 and 25 with Pete Alland and Richard Ives opposite. 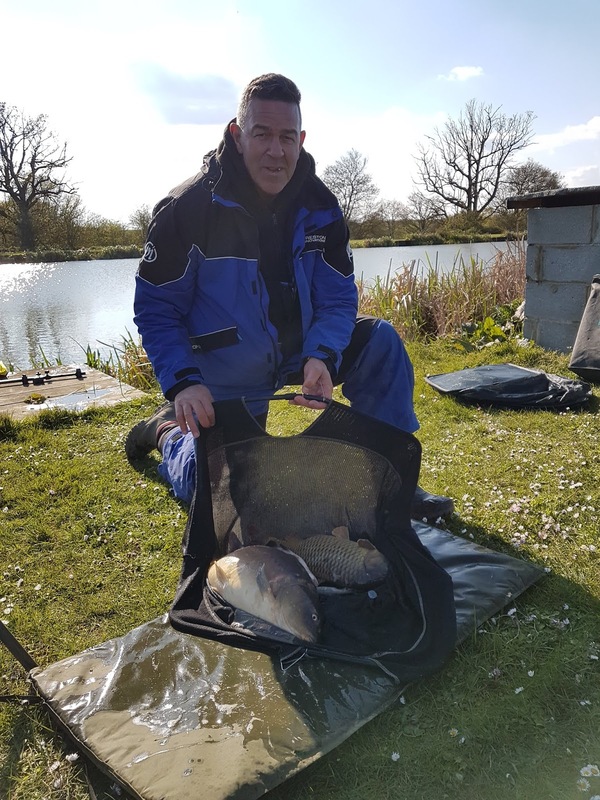 I had been reading Gary Thorpe's report on the venue and knew I was not in a good area, whereas Mick could do well as the light easterly wind was blowing into that end of the lake. Looking out across the lake there was hardly a ripple with a lot of cruising carp pairing up, maybe getting ready to spawn. I decided on four lines on the pole today, 12m pellet line both up and down. a 6m line for corn and two margin lines to the empty platforms with maggot. I had a tip rod with me and decided to get it out if those around me were catching on it. I started off at 12m and only fed through a toss pot to start with. A lesson learnt from another venue where I overfed it in the first 5 minutes and blew the peg completely. I was fishing a 6mm hard pellet but feeding 4mm fishery pellets dampened down. Nothing for 15 minutes. I switched to a couple of red maggots, nothing half hour gone. I had been feeding the 6m line with a few grains of corn and tried that, nothing. Rotating back around, nothing. Neil on the next peg was biteless, Paddy was biteless, the far bank were biteless. Peg 27 and below had a fish each with the end peg 35 and peg 1 on the opposite bank had a couple of fish each. Mick was also catching. I would like to say that things improved and keep you all on tenterhooks but I cannot. Neil on 21 had one bite at 1430 and missed it, I did not have a bite on any line. Paddy had one fish at 1500. Pete and Richard both had one fish and the guy in the opposite corner had three or four fishing to the left hand bank on the tip. So a hard blog to write, as nothing happened, I changed rigs, depths shotting patterns etc. I just get the feeling the fish were not there, except cruising pairs. Even with a long line and short rig could not interest them in having a nibble. Mick had come second on our bank with 42lb, fifth overall behind John Brewster's 45lb. Richard Wall won with 54lb from peg 1, Barry Eddy on 4 with 49 and Dizzy 44lb from 7. So all the weights came from the entrance end of the lake. It was a struggle up our end with many not weighing in and others biteless. So there it is, my first blank since I started blogging, not just this site but also the old Zanga site. Another loss to Mick to make it 3-1 in his favour and my next match is at Oakfield Red Kite next Wednesday. Things just get better. After last week I was keen to put the events behind me. I had to work all over the Easter period as was shifted on and missed out on all the opens at Oakfield and Alders Farm. This match suited as both Mick and I finished work Tuesday morning and as Wednesday was free we booked on to the midweek match at Oakfield. Mick had done well last week with 45lb from peg 33 whilst I had to swallow my pride and admit to not having a bite. Some kind words from a few other anglers softened the blow and I have realised there were not the numbers of fish up that end of the lake. But today is a different day and fish swim so hopefully a good day was going to be had. Arranging to meet up in time for breakfast at Chez Stratty we were both pulling into the car park around 0745. Mick ordering his normal full English, whilst I care about my body and opted for a simple Bacon Sandwich and a mug of tea. As is always the case, it was good to meet up with Storming Norman, looking well and healthy after all his heart problems throughout the years. Pacing himself for the Stafford Moor Veterans Festival with the MK Lads in a few weeks time. I had enough fishery pellet left over from the previous week so did not need to purchase any. I still had a couple of tins of corn and some maggot for the edge. At the draw Mick pushed his way past me and plunged his mitt into the tombola barrel and out comes peg 33 again (did he hand it back last week? ), a big grin across his face said it all. For my sins, the hand went in and out comes peg 20, two pegs further away from the fish than last week. And a peg that at the weekend the owner had left after two hours muttering he had not had a bite. Oh dear, another grueller was expected. Still I had with me a positive mental attitude with me, I had no one next to me either side, plenty of room, I could chuck a feeder to the right hand bank. I also had Barry Eddy and Pete Alland opposite me, and they always have fish. At the all in I started off on the pole in front of the platform of 19. I did not feed it at all just hoping to mug a fish early. After 10 minutes I fed the line with a pot of pellet and a few grains of corn. I would fish maggot later on it but wanted a bait that would not sink into the bottom. Onto the maggot feeder and only a couple of liners to show for 30 minutes work and I needed to touch the grass to get them, anything away and nothing. Switching to the long 12m line with pellet and my first bite at Oakfield for seven hours, missed it. Feeding again with a toss pot and a good carp around 7lb was soon making its way to my net. Out again and nothing, I added a couple of grains of corn to the feed to see if this made any difference. Impaling a grain of corn on the hook and shipping out, the float settled before sliding away, fish on and another 5lb carp. Barry had one fish, whilst Pete was on two. the pegs in the middle of the lake were catching well, Brian on peg 23 was nicking odd fish and I thought my were slightly bigger. Plugging away I managed a couple more good sized carp on corn feeding a mix of corn and pellet before the fourth hour went very quiet. A switch to the 5m line saw a couple of carp for around 12lb before this line also died. I noticed a lot of anglers, starting to catch on a line around 9m. I tried it with both maggot and pellets but only had one bite but is something I may need to focus on in the future. My margin line never produced a bite all day, so I stuck it out at 12m for another couple of corn fed carp. My highlight of the day was seeing a Red Kite hovering over the lake, seems absolutely effortless and I never realised how big they were. At the all out I was pleased with eight fish for 50lb 7oz. I had a few more bites and although I could not get all the lines to work it kept me interested. I probably spent too much time on the long line trying both up and down in the water in hindsight. 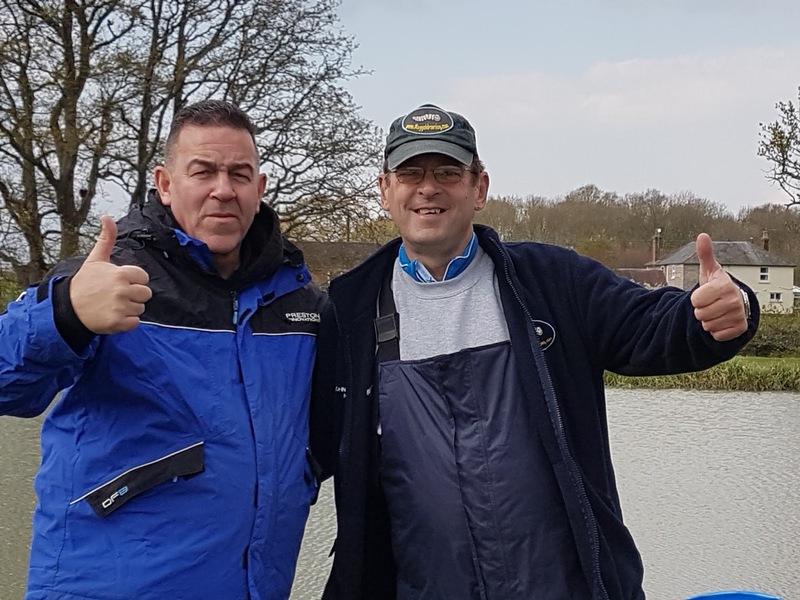 Mal Talbot won the match with 133lb 13oz from 29 Neil Reid also had a ton plus weight with 105lb and Pete Alland sneaked into 3rd place with 84lb. Mick could only muster 48lb 8oz from his flyer, so another MK Nugget found its way into my pocket. Mick still leading the way though 3-2. Our next match is on Saturday at Claygate Lakes near Maidstone.